The mysterious disappearance of media mogul Connie Ross during a party on her yacht exposes a web of dark and twisted secrets. Jimmy Frail, Chief of Detectives, suspecting foul play and the potential media circus, partners a most unlikely pair of detectives. Gigi Mirabelli, a missing persons’ officer, is recalled early from maternity leave to work with Harry Burns, a brilliant, but tormented homicide detective looking to restart his sidelined career. Suspecting murder, but unable to prove it, Mirabelli and Burns must first find a way to work together before they can hope to solve this perplexing crime. They first develop a working partnership of opposites and then skillfully sift through the evidence; all while walking the political and media tightrope in this high profile case. Fame is obviously an addictive drug to many. It takes a person of very strong character not to fall prey to the allure of fame, or to maintain their values despite fame. Those starting with weak or no values are particularly susceptible. Because the process of losing one’s soul to fame was intriguing, I began to develop the storyline of a modern day media mogul who lacks inner values and thus destroys many lives in her wake, triggering several murders. I hope that you enjoy it. My characters are based upon my large extended Irish/Italian family, which is full of unforgettable personalities. They say write about what you know, and I know well the virtues, flaws, and frailties of the human condition. For example, my main character is married new mother, struggling to juggle all that that entails. She is based upon my experiences as a divorced single mother raising two daughters. The blaring party noise seeped out of every crevice, breaching Connie Ross’ sanctuary. The dramatic change in the weather compelled the party to convene in the lounge one deck below. Connie could hear the persistent, low buzz of indistinguishable chatter marred by occasional bursts of laughter. It shocked her from her languid stupor. Ross staggered from her compartment onto her private deck, and leaned against the rail as the yacht unhurriedly cruised to its final destination. Her head swirled in unison with the swirling waters below. Breathe, Ross told herself. Breathe. She hoped that the fresh air would bring her back to life. Inexplicably drowsy, Ross had been forced to leave her party. She now held tightly onto the rail as she bobbed and weaved in time with the churning waters. Stepping out of the darkness, the velvety-voiced visitor could barely be heard above the ear-shattering party music. “I’m glad y-you’ve come. Not feeling well, too much to drink…guess.” Ross heaved, wiping the perspiration from her brow with her hand. She felt breathless. “Relax. Close your eyes and take long deep breaths,” said the reassuring visitor whose hands traveled from Ross’ lower back up her spine to Ross’ neck and head, and back again, over and over. “Oh-h-h…yes-s-s…” Ross purred as those wonderfully strong hands repeatedly worked their black magic. Drifting, drifting off, she soon released her grip on the deck rail. Ross was floating now. The hands, with palms flat against her back, deliberately massaging her, now lingered in position with fingers tenderly tapping along her spine before giving her lasting relief with one forceful push against her back that sent Ross over the rail. She plunged into the abyss. Drugged, pushed overboard, murdered. 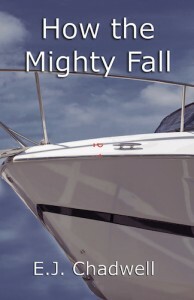 Her last conscious feeling was the painful splat her body made against the churning wake of the yacht.